The West Coast Wildlife Centre welcomes the very first kiwi chick to hatch this kiwi breeding season! 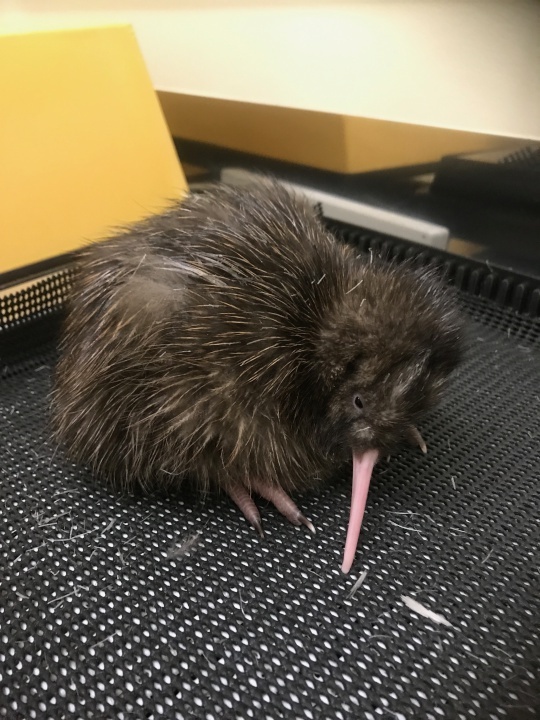 The hatching season for the world’s rarest kiwi has started early in the South Island, with the arrival of the first rowi chick successfully hatched at the West Coast Wildlife Centre in Franz Josef early this morning. Weighing in at just 309gms and taking 77 days to hatch, “KAMI” was a perfect hatch and looks like being one of many expected this season. Already 21 kiwi eggs are quietly incubating at the West Coast Wildlife Centre in Franz Josef, with up to 80 eggs expected in this season. Rowi are the rarest kiwi in the world with less than 500 birds left alive in the wild and found only in the Okarito Kiwi Sanctuary near Franz Josef, South Westland. Since opening in late 2010 the West Coast Wildlife Centre has hatched 232 rowi kiwi chicks and 106 Haast tokoeka. A passionate Kiwi Ranger team of 4 people, works full time on the hatching programme led by Kiwi Husbandry Manager, Nicki van Zyl and in partnership with the very able local Department of Conservation team. “It is such a privilege to be involved in the husbandry of such an endangered species and its really special to be present for the very first hatch of the season” said Nicki. Rowi eggs are removed from the forest for safe hatching because kiwi chicks are vulnerable to predation by introduced stoats. Eggs are hatched at the WCWC and then transferred to pest free islands before being released back into Okarito forest, once they are less vulnerable to predation. Rowi threatened species status was recently downlisted from nationally critical to nationally vulnerable - a significant achievement in conservation. Visitors can see the work first hand on a Kiwi Backstage Pass Tour which operates four times daily. “It has been a wonderful start to the kiwi hatching season” says owner Richard Benton, who is currently building with his team a new Tuatara Encounter inside the attraction which opens to the public on Sunday 1st October 2017. The West Coast Wildlife Centre is the South Island’s largest kiwi hatching facility and open to the general public from 8am daily. It is the official hatching and rearing programme for the world’s two rarest kiwi – the rowi and Haast tokoeka - and is a very successful public and private partnership with the Department of Conservation. It has won the West Coast Leading Lights Awards and has been judged by Lonely Planet as one of its top 12 favorite new places to visit in New Zealand. Here visitors can go “Behind The Scenes” to see for themselves the kiwi hatching and rearing facilities, meet the dedicated team of kiwi rangers, and see the world’s rarest kiwi’s up close in the nocturnal house and bush walkway. Numerous businesses, local dedicated people and visitors to New Zealand have proudly supported the West Coast Wildlife Centre’s kiwi sponsorship program, which helps the West Coast Wildlife Centre to fund purchasing kiwi food, incubation and brooder room equipment, veterinary products and build new facilities. Find more from West Coast Wildlife Centre on InfoPages.